Recently Barrons studied the effect of Amazon.com buying Whole Foods for US$13.7 billion. 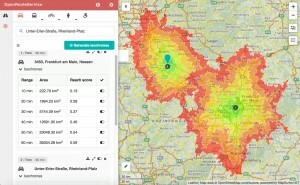 They used the OpenRouteService Isochrones API for an detailed accessibility analysis of the whole US. With OpenStreetMap based OpenRouteService and US Census data they calculated how much US population is covered within different driving times from the US wide network of the 444 Whole Food stores plus the AmazonFresh/Pantry locations. They conclude that over 70% of the U.S. population, roughly 224 million people would be within one-hour delivery by Amazon and for example all of Manhattan within 10 minutes. Barrons sees this as a potential game-changer for Amazon, which tries to strengthen it’s “last-mile” delivery network as well as grocery sales. The analysis demonstrates the power of accessibility analysis using OpenRouteService Isochrones API (the new version has been introduced here) for business analysis, site selection and logistics in nearly any domain based on OpenStreetMap data. Just imagine the power of combining this kind of analysis with the new OpenRouteService Places location service API. A early sneak preview of parts of that POI location search is available on the recently started Labs.OpenRouteService.org for experimental new features.